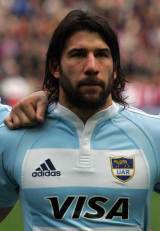 Full-back Ignacio Corleto made a try scoring debut for Argentina against Japan in 1999 and has gone on to secure 38 caps. Beginning his career in Buenos Aries with Club Universitario de Buenos Aires (known as CUBA), Corleto played U21 and Sevens for Argentina before being selected for the 1999 World Cup. Corleto started the group game against Japan and in the quarter final playoff victory over Ireland before playing in the quarter final loss to France at Lansdowne Road. Following the World Cup Corleto made the switch to professional rugby with French side Narbonne, where he would ply his trade for two seasons between 2000 and 2002. During this period Corleto would put in try scoring performances for the Pumas against Ireland and Australia and would also play against England, New Zealand and South Africa. In 2003 Corleto made the jump to French giants Stade Francais, winning back to back Top 14 titles in 2003 and 2004. Corleto was also selected for the 2003 World Cup in Australia, scoring in the opener as Argentina were beaten by the fired up hosts Australia in Sydney. Argentina exited the tournament at the group stages following a defeat to Ireland and Corleto would experience more disappointment when he missed out on the squad for the 2005 Heineken Cup final against Toulouse, a match that his Stade team went on to lose. Corleto's greatest achievements at international level would come in the 2007 World Cup, where he was instrumental in Argentina's dazzling march to the semi finals. His installation as full-back for the tournament was helped by his Stade Francais team-mate, and arguably the world's best full-back, Juan Martin Hernandez switching to a new position at fly-half ahead of the opening game. He scored the opening try of the tournament to sink France and went on to start every match as Argentina finished third after a marathon effort. Corleto again scored against France in the third place playoff, securing his place as one of the stars of the tournament.